Wensleydale can be used as table cheese and is very tasty with apple pie. This cheese is based on the recipe that can be traced back to the Cistercian monks who came over with William the Conqueror in the 11 century.Mild and crumbly lactic flavour. As mentioned by Wallace and Grommit. Made with pasteurised cows milk and suitable for Vegetarians. Mild wensleydale with the addition of tart cranberries. Very popular. Made with pasteurised cows milk and suitable for Vegetarians. 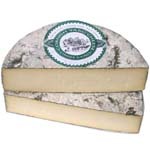 A Brie type cheese made with unpasteurised ewe's milk and suitable for Vegetarians. This is a subtle cheese with an unrivalled delicacy of texture and taste. As good as any French ewes' milk cheese. Rich and unctuous - a delight. 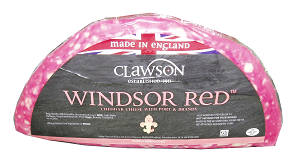 A blend of Wensleydale with cranberries Made with pasteurised cows milk and suitable for Vegetarians. White Stilton with the addition of apricots. Mild cheese with a sweet and fruity taste. Made with pasteurised cows milk and suitable for Vegetarians. Made with the milk from Friesland Ewes near Thetford. This hard cheese is very much in the style of a young Spanish Manchego. Made with pasteurised milk and suitable for Vegetarians. A blend of Cheddar with Port and Brandy. Traditionally a cheese bought at Christmas but is now becoming popular all year around. Yarg cheese is a semi-hard, cow's milk cheese made in Cornwall. This cheese is carefully wrapped in nettle leaves to form an edible, though mouldy, rind. "Yarg" is simply "Gray" spelled backwards, after Allan and Jenny Gray, the creators. Mild and tangy. Gold in 2002 and Silver in 2005 at The World Cheese Awards. Made with unpasteurised cows milk and suitable for Vegetarians. A soft blue cheese with a creamy texture.Mellow flavour that matures quickly with age. Made with pasteurised cows milk and suitable for Vegetarians.